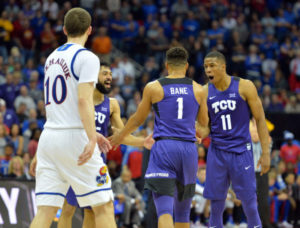 TCU shocked the college basketball world Thursday afternoon in the Big 12 Tournament, defeating the No.1 Kansas Jayhawks in the quarterfinals, 85-82. TCU freshman guard Desmond Bane made three free-throws with 2.5 seconds left to play to break an 82-82 tie, and Kansas missed a potential game-tying three-pointer at the buzzer. Dixon didn’t know if Bane was even going to shoot the free throws after the hard hit that drew the foul from beyond the arc. Bane rewarded his coach’s faith by staying cool under pressure. “We ran a high-ball screen for one of our better penetrators, Alex Robinson, and I know he likes to throw that drift pass to the corner and I was spotting up, hands-free, ready, and he found me and I shot and luckily I got fouled, stepped to the line, all my teammates came up to me, tried to calm me down, make sure everything was cool and I stepped up to the line and knocked ’em down,” Bane said. The Horned Frogs are now the first No. 8 seed to reach the semifinals of the conference tournament since 2001, and it’s TCU’s first appearance in a conference basketball tournament semifinal since the 2000 Western Athletic Conference tournament semifinals.